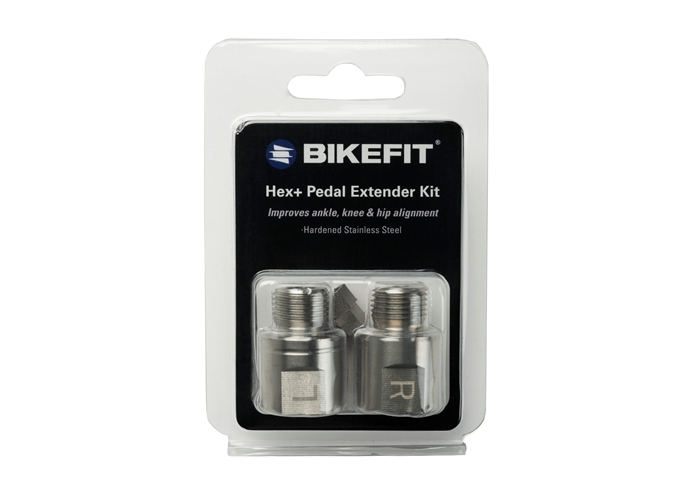 Pedal Spacers (Pedal Extenders) for Look Keo (and related pedals ) that need a Hex Key Wrench for installation. Left and right stainless steel 20 mm Hex+ Spacers (Pedal Extenders) are used with knees that track outside the pedal by adding length to the pedal axle. These Pedal Spacers (Pedal Extenders) are intended for pedals that DO NOT have wrench flats (pedals that are attached to the crank arm with a 6 or 8mm Hex Key). Not intended for use with Carbon Crank Arms. Our Left and Right stainless steel Hex+ (20mm) Pedal Spacers (Pedal Extenders) are used with knees that track outside the pedal by adding length to the pedal axle. Designed to move the foot out and away from the crank arm to provide more foot clearance, they add to stance width for cyclists needing help with knees-out, excessive toes-out, extra wide feet, wide hips, or for those with discomfort on the outside of the knee. These Pedal Spacers (Pedal Extenders) are intended for pedals that DO NOT have wrench flats (pedals are attached to the crank arm with a 6 or 8mm Hex Key). Designed with a thru-hole to allow a 6mm or 8mm Hex Key for attachment. Installed one right extender to the right pedal. Felt comfortable after a 30 km ride. Then added another extender to the left but felt unnatural. Today rode 74 km with the right extender only and felt great. Convinced that my body was not seated properly before and the right extender has now corrected it. Great product.